Albert Jake Kingman Turquoise Bracelet size 6 1/4"
This wide, uniform-width bracelet by Navajo smith Albert Jake is reminiscent of Navajo pieces from fifty years ago. 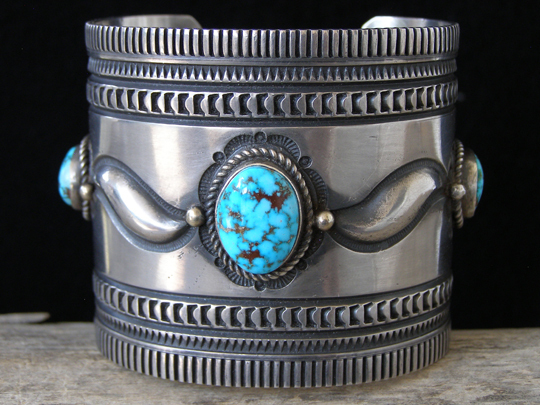 Using spare decorative elements, this relies on bands of stampwork to decorate the edges of the cuff with repoussée S-curves tying together the three fine natural stones of webbed Kingman turuqoise from Arizona. These stones are thick, high-domed stones set in smooth bezels and wrapped with twist wire. **Note On Sizing**: This cuff is 2 3/16" wide. It has a gap of 1 1/8". Because of its very wide width, it will best fit someone who normally wears a size 6" or 6 1/8" bracelet in a one-inch wide bracelet. Stones: center 5/8" x 1/2"; left & right 9/16" x 7/16"